But Farthing was not a genre novel. If you don’t understand what I mean or feel insulted by my description, then hear me out. When we classify books by genre, we are almost always placing a mental sticker on the cover that declares this work of art is only for people who like this sort of thing. Consider a blatant exception: I feel no need to warn someone that Lord of the Rings is a fantasy novel. Half the covers I have seen for the book don’t play up that aspect either. In short, read Farthing because it’s a damn good book. Then, there is Tooth and Claw. Serendipity is disturbing like fate and fervor, except that it at least admits that probability is in favor of the human mind seeing relationships where none exist. I had recently gotten into Anthony Trollope because it seemed like time for another long novel. Watch enough BBC and you feel a little guilty about not knowing enough about Victorian literature. 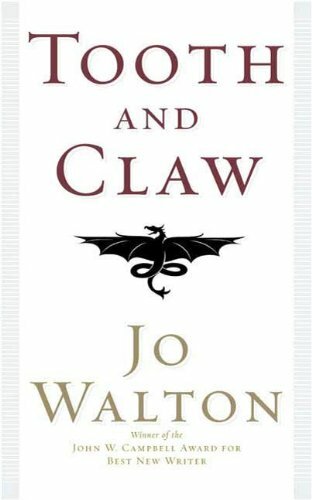 Essentially, Tooth and Claw is Trollope with dragons. Mind you, I don’t mean that the Earl of Dang-on-Blast’It discovers a dragon in his estate cave; I mean that the Earl is a dragon, as are all the major characters, especially the Parson. I don’t think you need to be a fan of Thackeray and Trollope to see the humor here. Surprisingly, the drama is quite affecting as well. 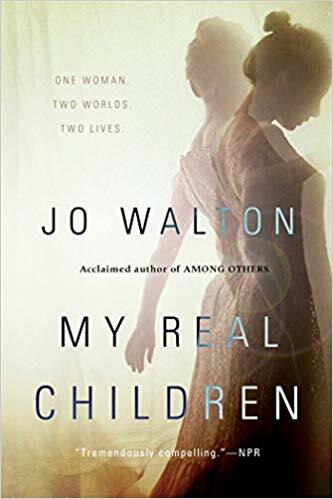 I recently finished My Real Children, which I did not entirely enjoy. That’s less a complaint than a statement of fact. The book deeply touched me, perhaps because it reflected so many experiences of the late middle-aged life in the here and now. Walton captured all the fears and joys somehow. The ending left me contemplative and a little confused, though that may be the result of my difficulty parsing it all out. I resent books with crap endings, but only if the rest of the book felt dependent on a crackerjack finale. My Real Children ended like life, which can be a crap ending, no doubt. We use art to escape that reality, but some art earns the right to let us contemplate those matters we wish to avoid. I recommend Tooth and Claw because it’s a fantastic read and I recommend My Real Children because it’s an overwhelming experience. For me, I find the description that such-and-such a book is “rip-roaring or crackerjack probably means that the work will be entertaining. Or it is meant to hide the fact that the work is so many empty calories with nice packaging. However, as with so much else in life, you can tell pretty quickly when you’re wasting your time. On the other hand, I have no idea when a work of art touches my emotions whether or not I am all alone there. Artists are forever saying “if my work reaches just one person…” Well, I’m here to tell you that being that one person can make for some uncomfortable touches. Wipe away tears at the movies and look around to see all dry eyes and you’re going to wonder if something is wrong with you. To be precise, I don;t know if I can recommend a work of art because of my feelings. It’s not that I don’t trust them, but that I don’t trust yours. Perhaps that is the real problem critics have. They need find a way to their readers’ brains because they have no idea where their heart might be. Maybe that’s why we all struggle to define great art- because we feel this need to explain it when we know that the definition is locked away deep inside the parts of ourselves that we’d just as soon not share with the world… a sharing which is the purview of the artist and not the critic.